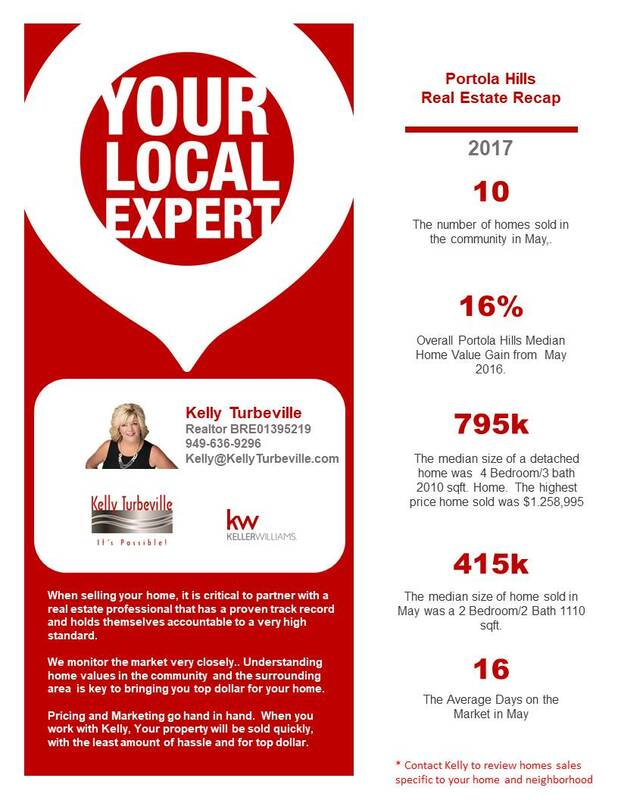 PORTOLA HILLS LIVING by Kelly Turbeville: Portola Hills Home Values Increase 16% from May 2016.. Is there still room to grow? Portola Hills Home Values Increase 16% from May 2016.. Is there still room to grow? You have heard the rule of supply and demand and it is certainly a factor in our latest market review for Portola Hills. Below is a look at how the market finished up and as you will note, we saw a 16% increase in values from May 2016. The above numbers are consistent with the overall Orange County market when I look at Detached Single Family homes. However, on the condo i.e. attached market, pricing is behind the rest of the county, where the average price of a a attached home was $477k. Opportunity is certainly available for home owners thinking of selling in Portola Hills. Homes that are priced well, in showing condition and available are receiving multiple offers. July is the transition time for the market as summer distractions take their hold on the market, but with the low inventory opportunity is still present! Let's grab a cub of coffee and review your home selling needs, along with the market to put a plan in place to get your home sold for top dollar.